This article is 3219 days old. Windsor Fire & Rescue Services are continuing to battle an outdoor blaze at Blue Point Plastics in west Windsor (see our earlier story with photos). 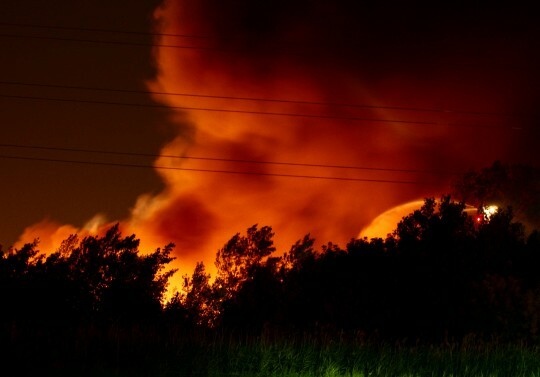 The fire started after 8pm Sunday night and is expected to burn until dawn. Firefighters are coordinating defensive attacks on the fire, hoping to contain any spreading to nearby homes, trees and an adjacent warehouse. Residents in the proximity of Peter and Hill streets were told to stay indoors and shut their windows. Although no official evacuation order has been issued, police are not letting anyone into a perimeter bordered by Prince to the north, Sandwich to the west, Ojibway Parkway to the south and the Essex Terminal Railway tracks to the east. Fire crews are expected to let the fire, mostly fueled by plastics, burn itself out over the course of the night while they concentrate on ensuring the safety of nearby buildings. Smoke is still billowing from the scene in an easterly direction over Mic Mac Park and other nearby neighbourhoods. Air quality is a major concern amongst observers, and no official statement has been issued as to the toxicity of the burning materials. If you live in the area, the advice from officials is to remain indoors with your windows shut.